Al Gore came to Google today, and gave a very slick and well presented talk about Global Warming, presenting in a neat package what is known and accepted by scientists about the subject, and what needs to be done right away. This talk is the basis for a documentary about the subject, coming out next month. Part of the talk concerned the Meridional Overturning Circulation (MOC) in the oceans, also called the Thermo-Haline Circulation, or the global conveyor belt. 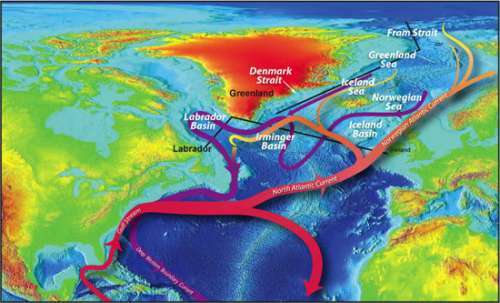 The MOC is the system of warm and cold ocean currents that redistribute heat from the tropics to the poles, and is the reason why Europe has a mild climate despite being the same latitude as Alaska. Part of the worry about global warming is that this current might shut down, making Europe much colder and the tropics hotter. Hotter tropics mean more and stronger hurricanes. Colder Europe means France might have the weather that North Dakota has, and similar wine production. So it was particularly interesting when I returned home and opened this month’s Physics Today, which reports that the MOC has slowed by 30% since 1957. As global temperatures rise, the warm water currents become warmer. This makes them more buoyant, and they don’t cool and sink as easily when they reach the poles. Added to this is that warm water evaporates faster, and warm air holds more moisture, so there is more water in the air to fall as rain when it reaches the cooler northern latitudes. This extra rainfall dilutes the salt water at high latitudes, making it lighter and less inclined to sink. In June of 2005, Ruth Curry predicted that the extra rainfall would take 100 years to stop the Gulf Stream, unless meltwater from the Greenland Ice Sheet sped up the process. She did not have the recent data showing the 30% change in the current in the last 50 years, or the recent data on the speed of melting of the Greenland glaciers. But I suspect Europe might be a little worried even if it does take until 2105 for the Gulf Stream to shut down. Their children might live long enough to freeze there. Europe is the same latitude as Mongolia, after all. And a good bottle of Mongolian red wine is hard to come by.